It begins with healthcare and sanctuary cities. 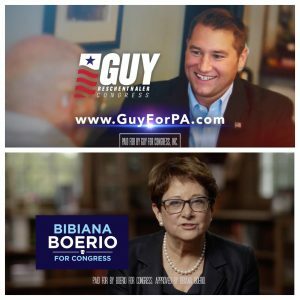 Democrat Bibiana Boerio and Republican Guy Reschenthaler, candidates for Pennsylvania’s 14th Congressional District, both have released their first television ads of the general election cycle. The candidates tout their resumes in the ads, while each focusing on one specific policy issue. Boerio’s 30 second ad details her various “titles” throughout her life and shares her mother’s health battles to advocate for protecting health care coverage for those with pre-existing conditions. The Reschenthaler campaign finds the assertion made by Boerio to be untrue. “Bibiana Boerio’s preposterous claim contains no details because it’s a complete fabrication — unsupported by fact, and issued by an out-of-touch liberal millionaire who would turn everyone’s medical coverage over to faceless bureaucrats in Washington,” said Dennis Roddy, campaign spokesman. The Boerio campaign believes the ad accurately portrays the candidates record, which they think shows her ability to represent the district. Congressional candidates in Pennsylvania centering their first television ads around healthcare coverage has become a common theme in 2018. The Reschenthaler campaign believes the ad showcases the best of their candidate. Boerio’s campaign lauds Reschenthaler’s military service, but questions if that necessarily leads to legislative achievements. “When “DC Swamp creatures are in for a fight,” be sure that Democrats are prepared to stand up for the people who they represent–not for special interests, not for personal benefits,” Jankowski said. The newly drawn 14th district voted for President Trump by 30 points. In the GOP friendly 9th district, the Republicans first ad also referenced “draining the swamp”, while the Democratic candidate in that race also echoed a message of protecting those with pre-existing conditions. If you see this or any ad, I invited you to flag it for me at John@PoliticsPA.com. Guy seems like such a phony. She didn’t, plain and simple. In fact, she said, “We respect and value Guys service to this country in Iraq”. Her raising the question how interrogating the Butcher of Fallujah translates to working across the aisle to get things done is a valid question. I say this with full disclosure that I’m an R, but we’ve come to the point where we don’t LISTEN to either side, and we get the absurd comments like “she’s disrespecting his service to our country”. It’s nonsensical crap like this from both sides that people hate politics. Bibie is not a socialist. She is a leader who cares about the people of southwestern Pennsylvania. She will work with colleagues across the aisle to developing winning programs for all concerned. Calling her a socialist is a desperate attempt to smear her name. And I never dissed Mr. Reschenthaler’s service, read it again. Seriously? Boerio’s spokeswoman just dissed Guy’s miltary service by saying it doesn’t qualify him to work across the aisle? What is wrong with her? Yeah that’s right. So stop wrapping yourself in The American flag and thinking that’s what makes you tough sh*t. You people are sick. BIBI is an outspoken socialist running in southwestern pa. Good luck there. You should read her resume and learn some actual facts about a woman who is far more accomplished than you appear to be.